So I mentioned on Tuesday that I went on spray painting rampage this last weekend and it wasn’t just limited to my front porch furniture revamp. Oh no girl, I sprayed everything that wasn’t moving. Spray paint is my weakness! As I looked at the enamel finish on all these baubles at Target, I knew from my experience that enamel spray paint can give the exact same kind of high gloss finish and once it’s dried and hardened, it is indestructible! I put all of the jewelry back on its hooks and I couldn’t get home fast enough to start spraying! Oh yeah, Momma has some new jewels!! 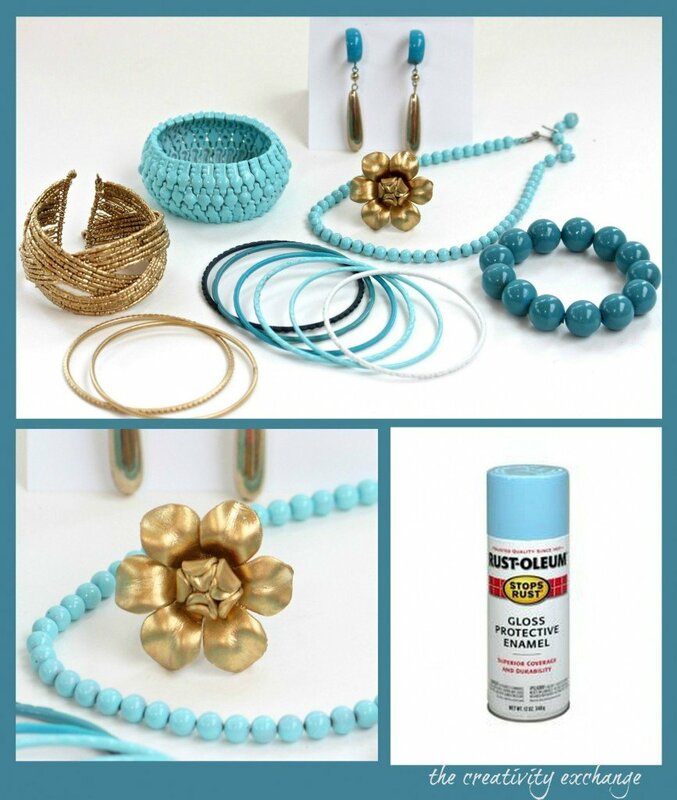 There are a few little tricks needed to spray your old junk jewelry that will make the process a lot easier and also ensure that you have the perfect finish. 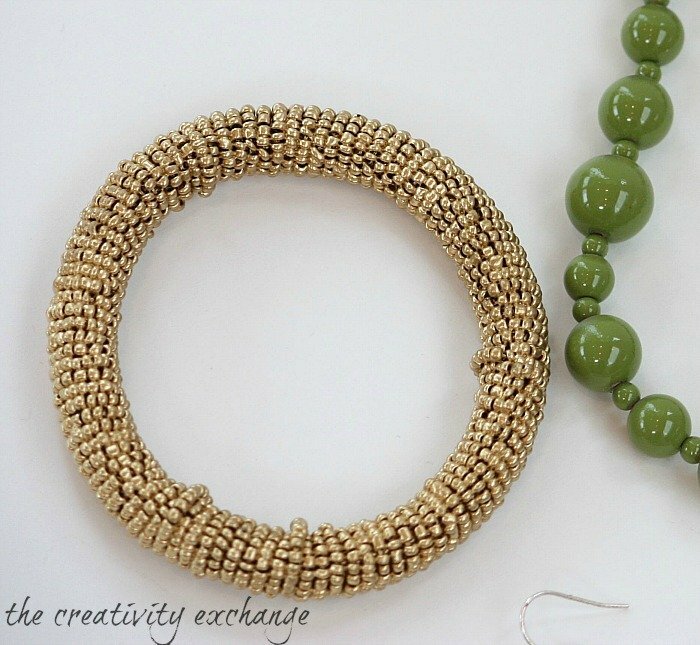 Below are the instructions to help you with the transforming yours pieces! 2) Prepare the surface of your old jewels by cleaning with soap and hot water. 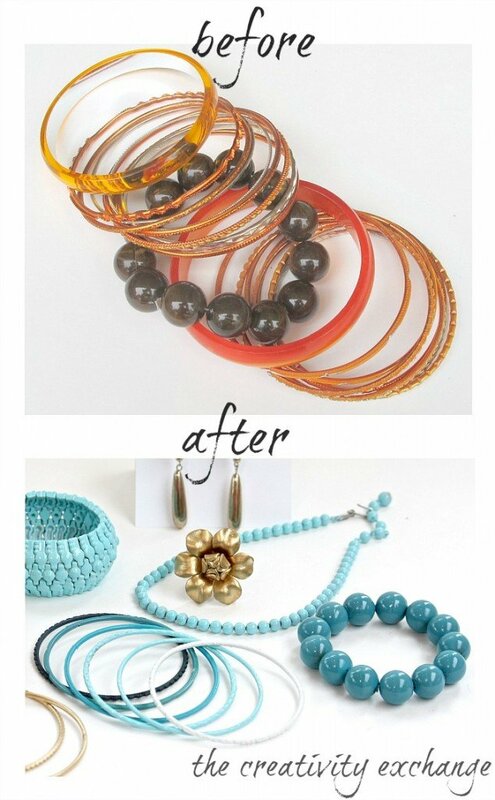 This is especially important with old dingy junk jewelry! 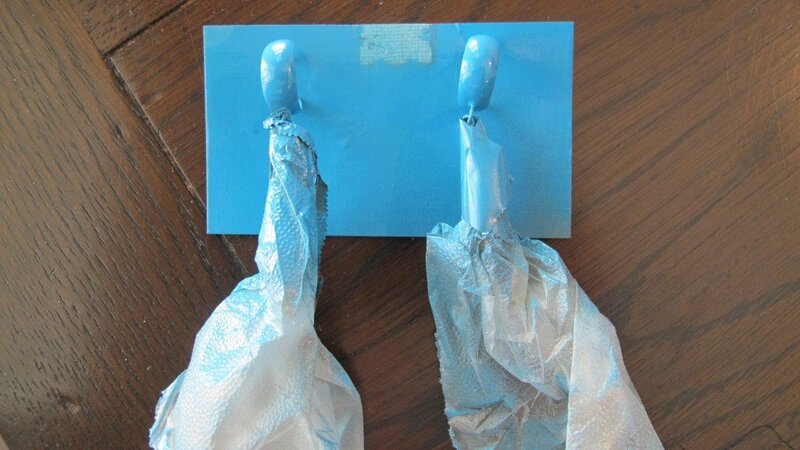 7)Chances are you will only need two coats. You want as little paint as possible. Just enough to cover the pieces because too much paint will clump. 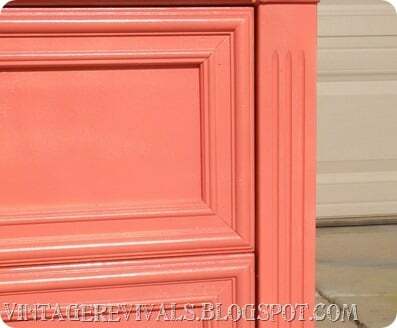 If you are not using an enamel spray paint, you will need to wait at least 1-2 hours and then spray a very light coat of the Rustoleum Crystal Clear Enamel. Spray another thin coat about 2 hours later. 8) Enamel paints take a very long time to dry/harden. It will take at least 48 hours for the spray enamel to dry completely. Once it’s hardened, you will be amazed by how durable the finish is! There is a trick to spraying the gold. Because the Rustoleum Metallic Gold is not an enamel, I had to do seal it with the Crystal Clear Enamel. When I did that, the metallic part of the gold burnished. So the trick is to seal it with the Crystal Clear but after an hour or so, lightly, lightly and quickly spray just enough Metallic Gold to get the metallic look again. This way the finish will be just as durable and still a pretty gold. 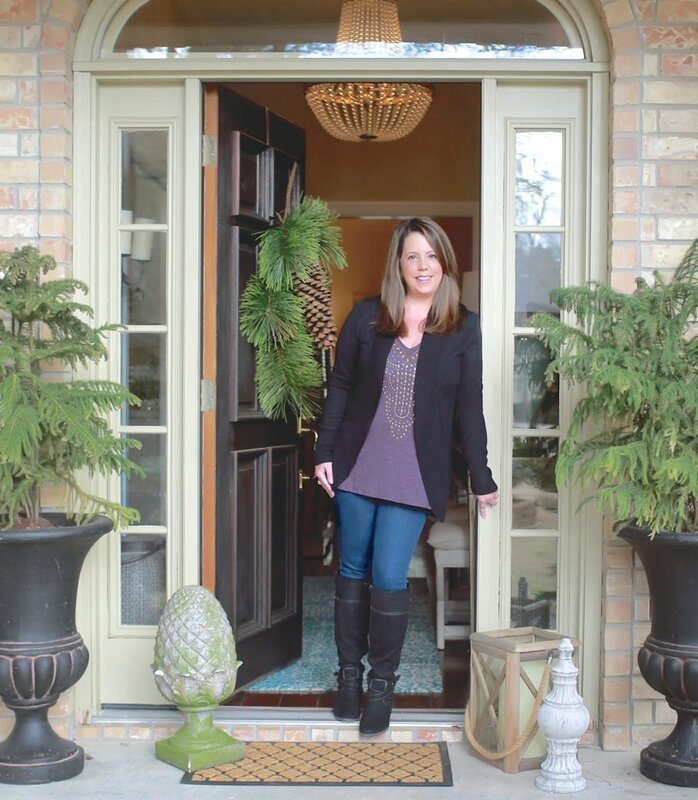 That image came from the fabulous Mandi at one of my favorite blogs Vintage Revivals. Well have I convinced you to drag out your old junk jewelry? I sure hope so because it was so fun watching these pieces go from junk to something fabulous and it hardly cost a thing! 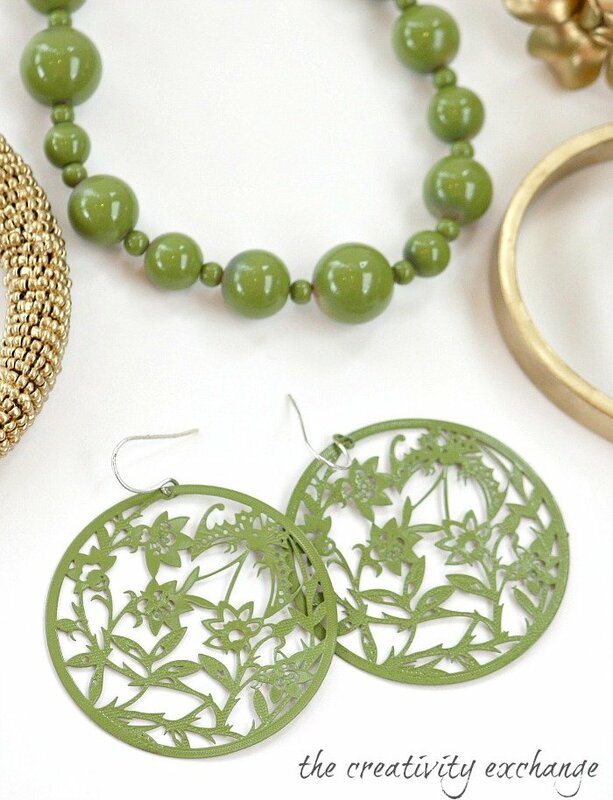 I’m ready for spring and summer with my great new baubles! So which piece is your favorite? I love them all but that gold cross beaded bangle is my favorite. I can’t wait to wear it and you would never know it was spray painted! Ha!! Thank you for hanging out with me today and I am skipping Friday Favorites again tomorrow but will be back on my regular schedule next week. Cyndy, I’m so going to do this. Was cruising long necklaces just last night for silver/navy blend, for jeans and jacket. So will spray some of stands darkest navy…. 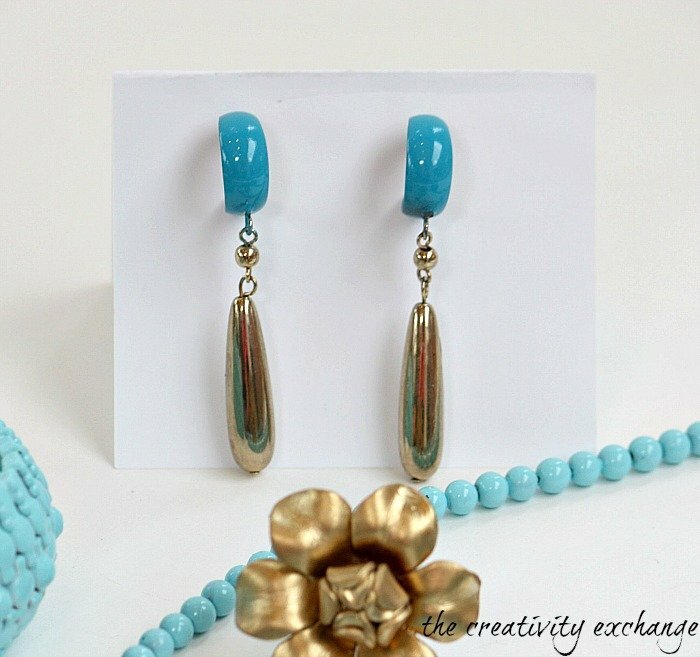 I’m also liking turquoise w/navy. 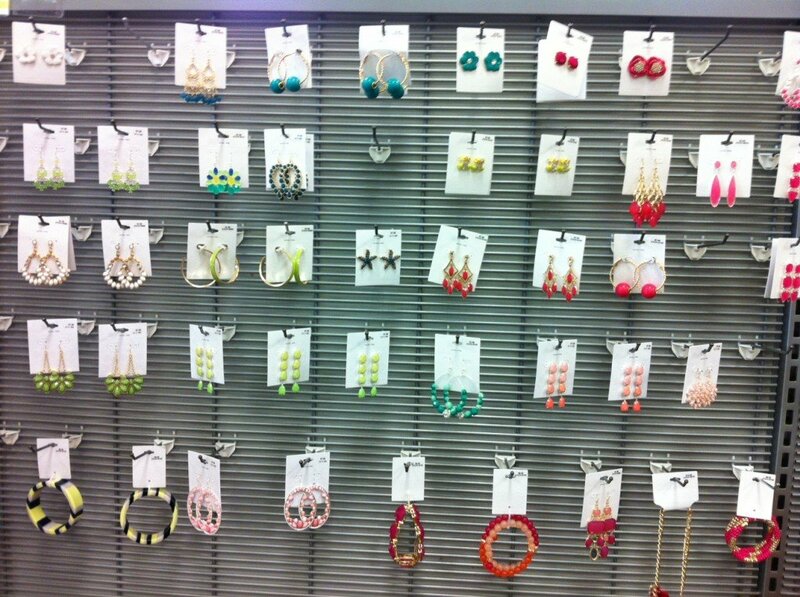 Earrings for sure…. My new fav in baskets is spray painted/dyed bottoms, great look. Thanks again for another fabulous idea Cyndy, love, your ideas….. Katherine in Portland. Thank you sweet Katherine! I did some long strands of beads in Valspar Indigo Streamer (Navy) that are not pictured and they turned out fabulous! 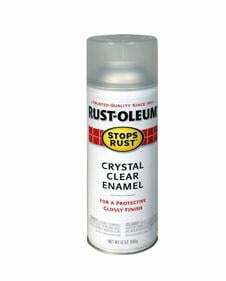 Lowe’s carries Valspar Indigo but it’s not an enamel so be sure and pick up the Rustoleum Crystal Clear Enamel. I plan on mixing the indigo with the green pieces you see and white and gold. Girl, I’m gonna be blinged out!! You’ll love the Indigo Streamer! Big hugs friend! This is incredible! I’m always on the lookout for ways to revamp my jewellery collection (half of which I forget about and end up hardly wearing) so I’m definitely going to be trying this out. I just hope I can get hold of some enamel spray paint just as easily in the UK! Thanks Ella! I’m sure there are some great enamels in the UK. Seems to be that there is an awesome brand that we can’t get in the states? I can’t remember the name but I think if your checked online, you could find sources. Thank you so much for stopping by! Thanks Tanya! I can’t stop spraying! LOL! Thanks for stopping by! Thanks Megan! It’s addicting! I can’t stop!! LOL!! This makes my summer! I love trendy jewelry and sometimes buy it often because it’s inexpensive but then of course it does fade or tarnish. I don’t like to be wasteful so this is a perfect solution!! What great makeovers, I am in New Zealand so probably cannot get this exact brand of paint but should be able to get something similar. I plan to use the same idea you have but on a chandelier that I removed from my mums house before I sold it. I think I might either jazz it up with a colour or use a silver spray. At the moment it is a dull gold and won’t really work with my decor, I want to hang it over my breakfast bar. Thanks for this great post as I can easily follow instructions and cover up the crystal droplets just like you did on the earring fittings. Thanks Lee! Yes, this process should work for a chandelier as well and would be fabulous! Thanks so much for stopping by!! Thanks for the inspiration – I have a box of jewlry that could be updated this way! 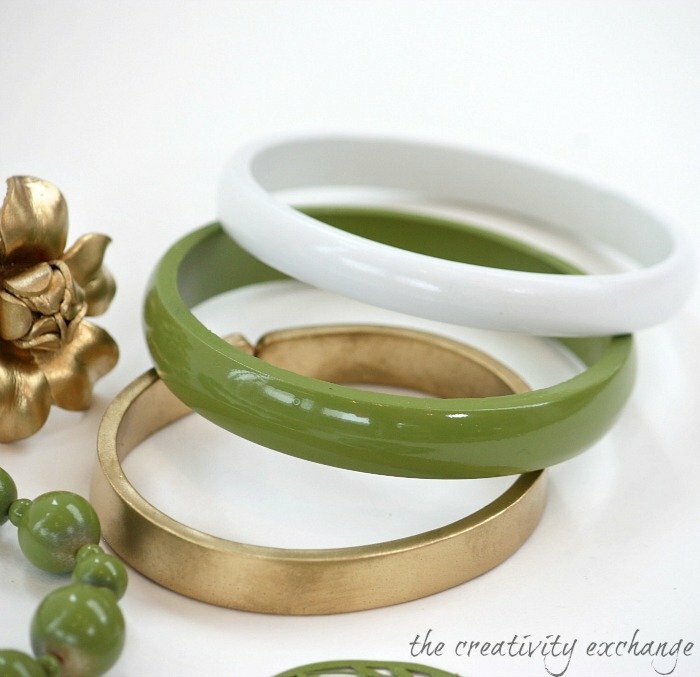 Do you have a paint recommendation for creating silver jewelry? I’m envisioning a brushed or “aged” silver, not a chrome look. Thanks Janet! I really don’t like any of the silvers out there. I think you would like the Rustoleum Brillaint Metallics in silver because its more of a brushed silver look and not chrome. Please let me know if you give it a try and what you think of the silver. I live in a small town in northern Belize. There are car part shops here that sell Ambro spray paint that’s for cars. I like how the Chrome Plate color does for silver, surprisingly! I like the Abro gold but it’s not so good for jewelry, but just got my Rusoleum Specialty Metallic Gold yesterday and can’t wait to try it! I LOVE this page, and have read it about 24 times. LOVE to do my own jewelry! I have thought of painting some of my older jewelry but I wasn’t quite sure how it would hold up so thank you for all your great tips. I am not sure that I understand which spray paints are the enamel paints? But I think I will be paint some jewelry tomorrow. I love this idea! I am doing this today!!! Thanks for the idea!! I really like this idea! I was just wondering how you got the stretch bracelet to get such good coverage. Do you need to stretch it while painting it? I am just unclear on how to get in all the nooks and crannies. Thanks for this tutorial! Hi, thank you for this tutorial! I have a question – can you do this for hardware (clasps and findings and shoe buckles)? I have some that needs to become silver/steel-toned (from gold-toned), and it’s not expensive enough to be worth taking to jeweler for replacement, but keeps me from using them. Would hardware like bracelet clasps still work after being sprayed? This tutorial is everything! Thanks so much for sharing! Can you tell me what gold you used? 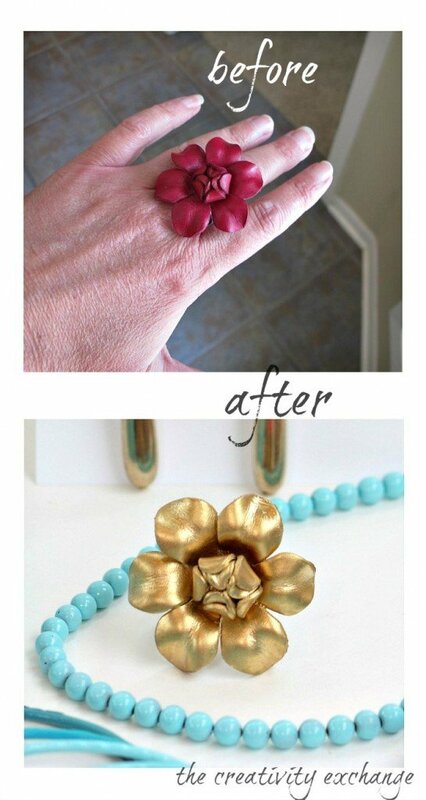 It’s just what I’m looking for to repurpose old jewelry! Wonderful info here! Thnx. Can you recommend a product that would duplicate a sterling silver finish? Have been wanting to paint a thrift store bracelet that has a not so nice gold finish but have not figured out how to get that done…i do appreciate the wealth of information on your site. So happy to have come here. Your site is saving me lots of time & research hours! girl you have made my morning!! I knew there was a way to do this. I am so grateful that I found you! I am so hooked on before and afters. I have place your site on my favorites and will be checking with you on the regular to see what you come up with next! You are awesome girl! Does this work with silver toned jewlry that has lost it’s shine? Have you tried re-paitining using silver? I’m with Jennifer. Is there a “metallic silver” that I can use to transform my faded silver fashion jewelry back to new? 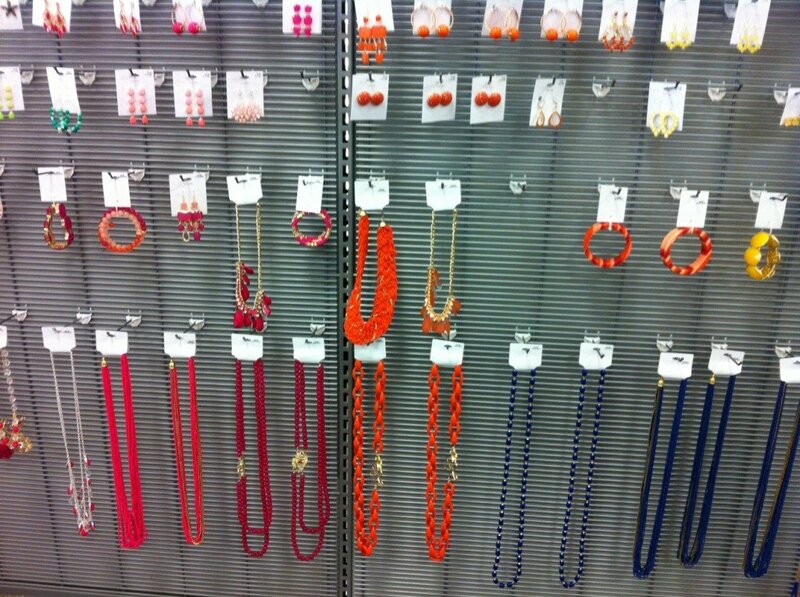 Most costume jewelry sold today in stores, especially the colored pieces is an enamel finish. Of course, I can’t for sure say whether or not something is toxic to the skin. I guess I would say if you can where all the costume jewelry out there with all the various finishes like enamel, you’re probably ok. However, I cannot say for certainty, so I would not do it if you have any questions. Thanks for sharing Rachel. This is great– exactly what I’ve been looking for! I’ve been wanting to refresh the look of some old costume jewelry that used to be “gold” and thought spray paint just might work. I still have one question, though: what sort of primer did you use? 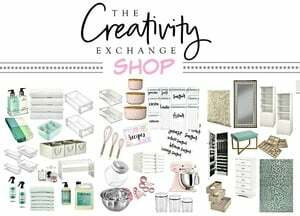 Your pieces look awesome– thanks for posting them! 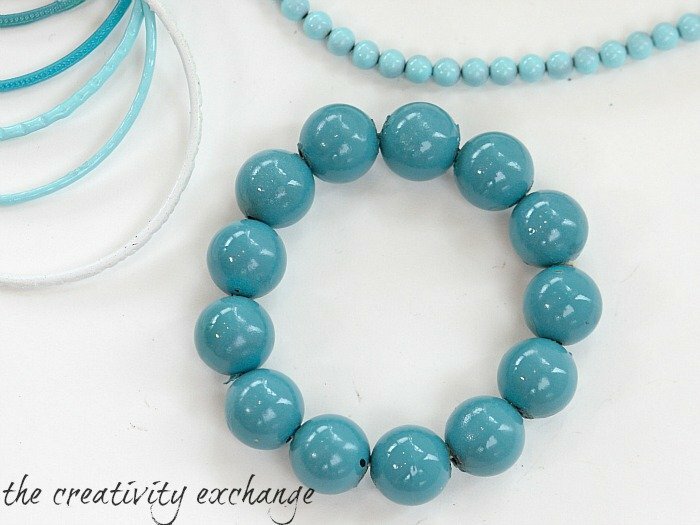 I am going to try this out on some non-metal jewelry. How have your pieces held up? Ooh! Very well done! 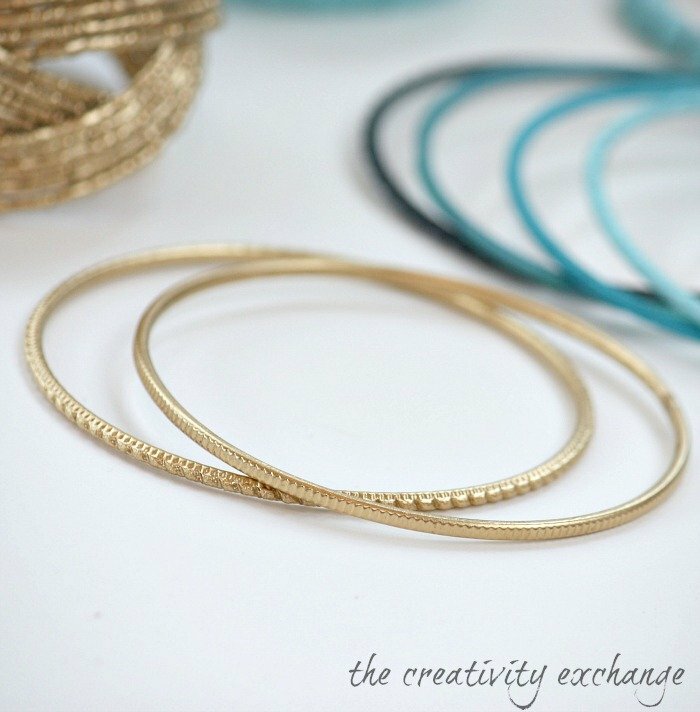 I love the gradient bracelets! I have a custom order for earrings needing the leaves painted green and I am nervous but going to give it a try. Seems like a lot of layers of paint/product and I’m worried about the smell lingering. Glad I found your post in my search! Hi… I painted some filagree last weekend for earrings and the smell is definately lingering! They look awesome, but I can’t sell/list them on my site until the smell is gone. Maybe it’s the brand of clear sealant I used? Not sure. I’ve heard that a heat gun might help to finish the curing process so that the smell goes away but to be careful not to burn the paint. I will try this tonight on a few of the pieces, hoping that will help. I’ll post here with my results! Anyone else have trouble with that laquer-ish paint smell? Thank you for the tips! I am still having a bit of a problem with the pieces that are simply too small to hang. It goes frustratingly like this…. I get a beautifully fully cured finish on one side of about 500 pieces of jewelry “findings” and then I flip them over and continue the process on the other side. I am careful to do the THINNEST coats possible, yet, somehow, the paint from the second side curls around and affects the first side that I did. When I pick up the pieces to move them, yep, the first side is ruined. Sometimes even sticking to whatever surface I have them on and pulling off the paint in places. If I flip again to fix those,,,the same thing happens to the OTHER side! HELP, PLEASE!!!! Thanks a lot for this marvelous tuto. what a good idea to paint odl jewelery. hope I will find that kind of paint in France. I believe similar product does exist. Thanks a lot for your share. For everyone that has asked about spray painting to get a silver tone color, I used Krylon’s Premium Metallic in Chrome and it worked wonderfully. I love the gold too that you did. I have a sterling silver necklace that is very important to me but I never wear sterling silver I only wear gold. Could I do the same thing with my silver necklace without worrying about destroying it? Any suggestions for taking a silver ring and painting it jet black in a way that will allow it to keep its color? Is it safe to use the enamel paint for jewelry that will be in prolonged direct contact with skin (i.e. necklaces and bracelets)? All costume jewelry is either enamel paint or metal coating. I have worn costume jewelry all of my life and have never had an issue with it or specifically, enamel paint. However, if you are sensitive to costume jewelry, chances are you would be sensitive to this process. Thanks for your note and stopping by. Love this tutorial! Can you tell me which brand/type of primer is best? I can’t wait to try this! Hi Robyn! I like Rustoleum primer in white. Hope that helps. Thanks for your note and have fun transforming! Since you’ve used enamel on jewelry, you would be the best person to ask about this. I’ve thought about getting a ring that is either brass with white enamel paint or a tin alloy with shiny sliver enamel. When I wear metals with copper, it’s not on my finger for long before it and my skin starts turning green(I always remove jewelry before washing). Would enamel painted rings eventually fade and turn green? Can you recommend a paint for getting a natural pewter look? I have been very interested in enamelling old jewellery since I saw your post about refurbishing old jewellery. I am currently living in the netherlands and cannot find anyone that ships to the NL. Do you know how I can get my hands on this clear gloss? Or do you maybe know what it might translate into in Dutch? I have searched everywhere but cannot find it and i really need something like for my jewellery designs. Can you please help me? Thank you and love our page! 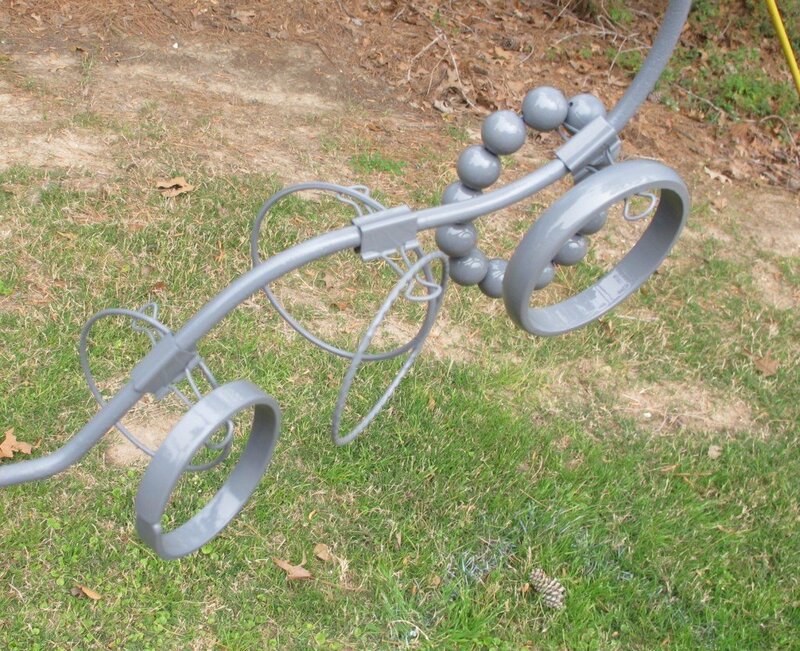 Cyndy, these spray painted pieces are amazing! I have a bunch of faux brushed gold pieces that are looking junky. I’d love to freshen them up like you did with the metallic gold. I don’t trust myself, so I was wondering if you would be interested in doing some pieces for me, with payment of course!! If not, could you walk me through the process specifically for the Rustoleum Metallic Gold. Your new gold criss cross bracelet is gorgeous! Hi. I need to know if I can use the gold colored spray paint that you spoke of on a pice of costume jewelry…a foux diamond solitair ring weith a gold colored band. The stone is a clear cubic sarconium (sp). What kind of spray paint and clear coat would I need to purchase? Also do I need to worry about any lead in the paint? Thank you so much. How long can this spray paint on a wedding ring last? Hi! My boyfriend have me a promise ring and the paint on it has pretty much completely rubbed off! I love this idea! But in worried about covering the stone that’s set in it. I’m afraid that the paint would make it under the tape.. What are some other ways to keep paint off unwanted areas? I’ve used just regular elmers school glue to cover gems- a thick blob of it takes a whileto dry but peels right off in one peice when it does. Same as being a kid and putting some in your palm then peeling it off…if anyone did that besides me haha. Make sure its cheap, washable kid’s glue. They are water soluble too- so in the event of a mishap warm water will wash off even dried glue. Hi, how can I spray on a gold finish that shines like regular new gold? Thank you. 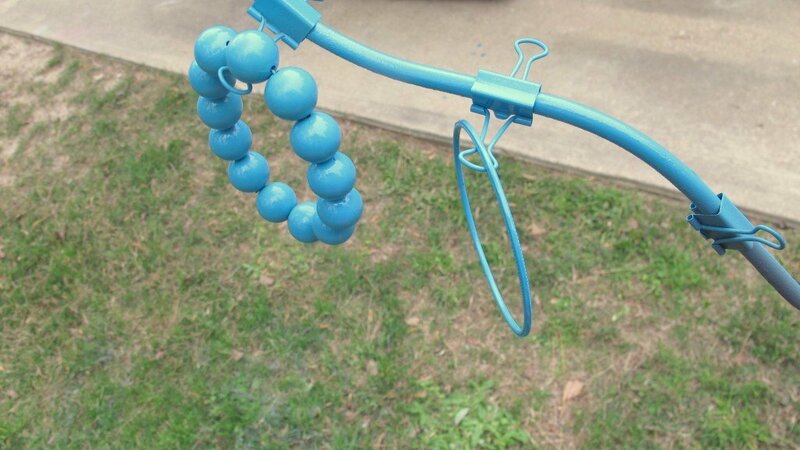 Hey, those pieces that you spray painted look amazing! I’m doing some research before setting out to make jewelry and I want my pieces to be this nice and glossy but i’ concerned about how it affect people’s skin. Have you or anyone worn these and had any complications? 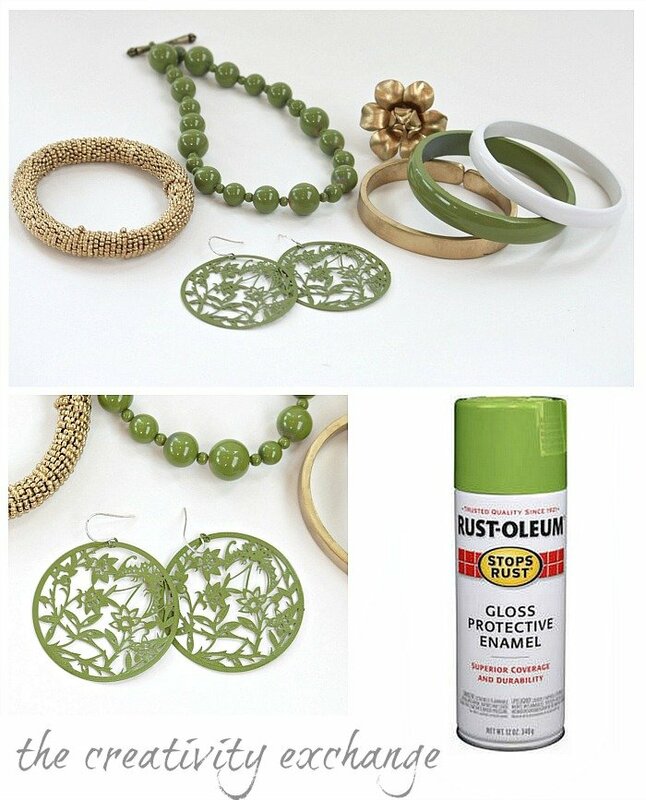 are there any skin safe spray paints that you can recommend to a future jewelry maker? I recently spray painted some of my oldest jewelry with gold spray paint to freshen it up a bit. I did everything that I was supposed to as far as giving it ample time to dry before wearing it. I wore it last night and I started rubbing off on my skin and now it looks like I didn’t even spray paint it. Is there something I’m not doing that I need to? Please help! Did you remember to put on the crystal clear enamel spray paint on after you let the gold dry for an hour or two? Believe it or not I have a challenge that might be up your ally. I have a Rosary (Catholic). The beads are made of stone/wire wrapped. I need to paint them and add a clear coat. Any suggestions? 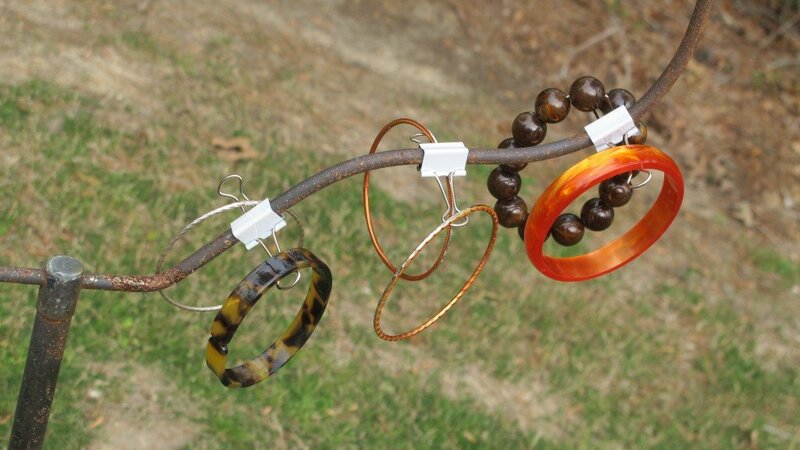 Hello, I was looking for some idea for my tarnished bracelets and this idea is an awesome one, I love it, but I am concerned about the spray paint, is it not toxic to the skin? This is my main concern. 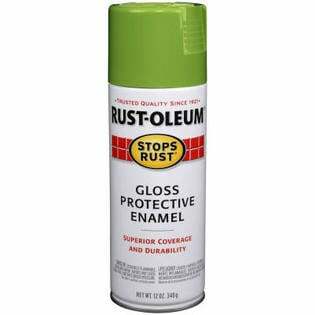 My husband accidentally purchased the rustoleum clear matte enamel..I was thinking of using it on some new jewelry I made..but have never tried this type before..I use another kind. Some of the jewelry has a glossy finish. The main purpose I am looking for is to keep items from tarnishing or giving people the infamous green skin..maybe I should just spray the interior part..